The name sounds like it belongs to a superhero. Instead, it belongs to a diamond of legendary and heroic stature. Just as every superhero has a backstory that explains the origin of their super powers, so too does the Red Shield. Unearthed in the jungles of Brazil, the extraordinarily rare and intensely colored rough weighed nearly 14 carats. 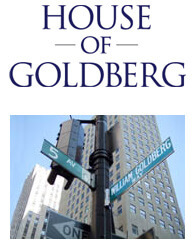 It took the vision and persistence of William Goldberg to ultimately reveal its true power and beauty. It required five trips to South America to secure the stone. But the effort paid off handsomely. What William Goldberg brought back to New York was something so unique and valuable that only a handful exist throughout the world – a deep red, Type IIa diamond. Statistics show that for every million carats of rough that is mined, only one carat of pink diamond is produced. And a true red diamond is even more rare. So here it was. A once-in-a-lifetime opportunity to create a super diamond. After much study, it was decided that the shape would be a modified triangular brilliant cut (also known as a trilliant cut). 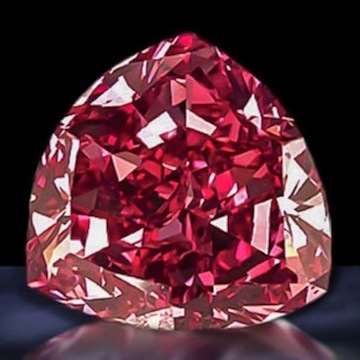 What emerged from the master cutters at William Goldberg was the largest Fancy Red diamond ever created. The 5.11-carat Red Shield. Over the years, the Red Shield has twice been displayed at the Smithsonian, dazzling thousands of visitors with its unrivaled color, unique shape and incomparable beauty. It truly is a diamond with super powers.